Sillux Redentore is one of great example of evolving lamp design. The Redentore is an eye catching suspension lamp from Sillux. The main material used to create this stunning lamp is chrome and blown pyrex glass. Each of the tip of this unique lamp is attached to a tiny twinkling light. 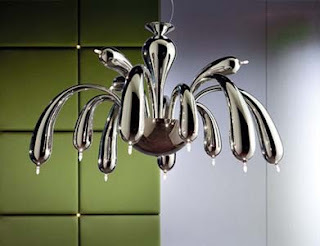 This unusual lamp has a spider-like shape that perfectly a great match for contemporary and modern interior.